Five years ago tomorrow, I started Gluten Free Philly with the shortest of posts and the intention of sharing my own experiences as the father of an 8-year-old boy with Celiac Disease. We were always calling food manufacturers, trying new products and dining out at restaurants anyway, so I decided to create an outlet to share this information with others who could benefit from it. Little could I have imagined that I'd be still blogging five years later amid a tremendous boom in the number and variety of gluten-free foods, accommodating restaurants and dedicated bakeries. Our school district now offers gluten-free lunches daily, gluten-free concessions are available at every major sports venue in Philadelphia, and nearly every supermarket in the Delaware Valley has at least a modest selection of gluten-free groceries. I'm extremely fortunate that so many of you have taken this journey with us and I appreciate the wonderful recommendations, comments and notes you have shared with me over the years. I take no greater pleasure in writing this blog than when a reader tells me that he or she has benefited from something they've read about here. There's been a flurry of new product announcements recently, largely coming out of last week's Expo West natural products show in southern California. Nature's Path has four new gluten-free cereals on the way, including two created for kids. 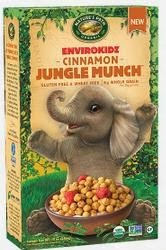 The new additions to the Envirokidz line are cornmeal-based Choco Chimps and Cinnamon Jungle Munch. For the big kids, there's Sunrise Crunchy Honey and Sunrise Crunchy Cinnamon. From Glutino comes a multigrain version of the company's English muffins as well as reformulated and improved bread varieties. Late July Organic Snacks has added to its snack chip line with restaurant-style Sea Salt and Chia & Quinoa tortilla chips. New to the freezer from Rudi’s Gluten-Free Bakery is all-natural Deli-Style Sandwich Bread with Caraway Seeds and a Double Fiber Sandwich Bread. Rudi’s also introduced Gluten-Free Cherry Almond Bars, which feature all-natural ingredients including cherries, chunks of almonds, honey and brown rice crisps. Each bar (seven to a package) is 120 calories and contains 3 grams of protein and 2 grams of fiber. Rudi's has a dollar-off coupon on its website available for download. The Earth's Best brand from Hain Celestial is expanding its frozen line with gluten-free Baked Chicken Nuggets, Sweet Potato Nuggets, Broccoli & Cheese Nuggets and Cinnamon French Toast Sticks. GoPicnic's latest gluten-free shelf-stable meals include non-GMO Almond Butter & Crackers, Edamame Kale Dip & Plantain Chips and Three Bean Dip & Tortilla Chips. 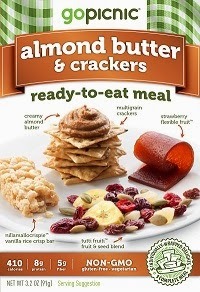 Also new are a line of snacks that include Almond Butter & Multigrain Crackers, Red Pepper Hummus & Multigrain Crackers, Black Bean Dip & Tortilla Chips and Zesty Salsa & Tortilla Chips. Several GoPicnic meals are available at Target and other retailers, and the company has free shipping for online orders over $69. 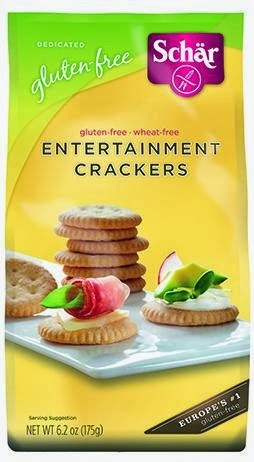 Look for Ritz-like "Entertainment" crackers, croutons, chocolate chip cookies and marble cake from Schar, which will be at the vendor fair at the CHOP Celiac Disease Education Day in Philadelphia on March 23. New in the world of hard cider are two new brands being launched by the country's largest brewers. As I wrote on Tuesday, Smith & Forge from MillerCoors and Anheuser-Busch's Johnny Appleseed will be on the shelves in the next few weeks. Bucks County staple Maggio's in Southampton (400 2nd St. Pike, 215-322-7272) has a two-page gluten-free menu ; be aware that the tortilla chips are prepared in a shared fryer. Philadelphia magazine's Be Well Philly blog reported that Pure Sweets is opening a retail gluten-free bakery and juice bar on Rittenhouse Square (1706 Locust St., 215-518-9007) on March 28. You can read more about Pure Sweets' baked goods in an earlier blog post. A Girl Scout troop in Abington Township, Montgomery County has extra boxes of gluten-free chocolate chip cookies for sale. Interested readers can contact Julie via email for more information. With the Gluten Free Philly app for iOS and Android devices, find more than 1,300 area gluten-free-friendly businesses on the go, search by cuisine or neighborhood, make reservations and more! To commemorate our birthday, it's on sale for just 99¢ today only! Congratulations, and thank you! You are a wealth of information and a resource we gladly share at every opportunity. you should try the Candy Tree organic and gluten free licorice varieties - black and three red flavors.